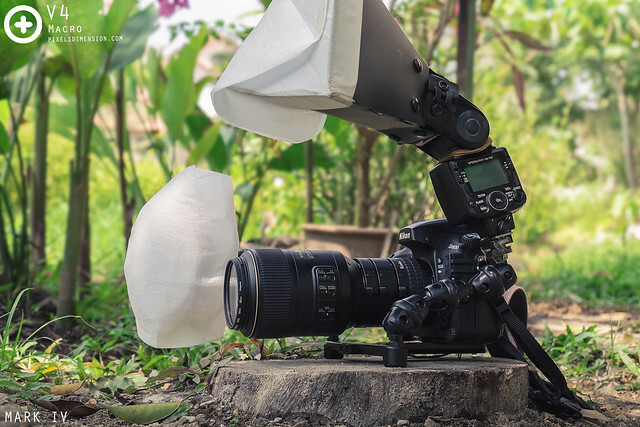 A Macro Rig is an essential tool to any Macro Photographer, which, when paired with great photography skills, one can create stunning images like no other. 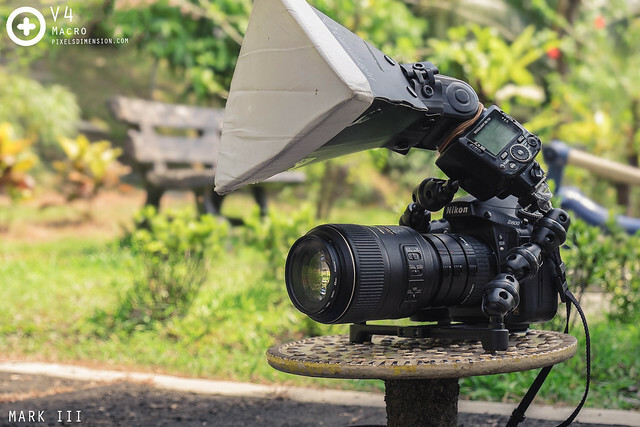 Although the available macro lens and DSLR body you can choose in the market are rather limited, the extremely diverse range of macro accessories (reverse rings, teleconverters, magnifying lens, microscopic lens, bellows, extension tubes, flash bracket etc. ), offers unlimited customizations to your core Macro Rig. And we haven’t even started talking about DIY accessories! A Macro Rig can be as simple as a DSLR and a macro-capable lens, or as complicated as a bazooka! It all depends on the photographer, and what he or she wants! This is why virtually every Macro Photographer will have a Macro Setup different from one another; this is because different photographers look at different aspects when it comes to selecting their equipment, which include performance, portability, ergonomics, affordability etc. Regardless of what you prioritize, there is certainly a setup out there that is suitable for you. Most of the Macro Enthusiasts out there would have some photos of the Macro Setups they have used, or are currently using; just to share with the world what they think is suitable for them (and perhaps you). Well, needless to say, I am one of them XD This particular article records the Macro Rigs I used to have until the ones I am using now. Of course, to make the article more informative, I will try to add in some Straight Out Of Camera (SOOC) shots. Since I am still not a pro, the setups that I am using now might not be the best out there, and my expectations may change with time and skills. Regardless, the Macro Rigs will be shared here with each upgrade. Mark I– My First Macro Rig, consisting of a simple 50mm prime lens, automatic extension tubes and a flashgun. By the time I was introduced to Macro Photography, I have already own a DSLR and was my way to becoming an advanced amateur in (Normal) Photography. I was more into Portrait Photography that time and had bought a 50mm prime lens and a Nikon SB-700 flashgun plus a strobist set for strobe shots. Unfortunately I wasn’t very good with it :p.
Anyway, since I already have a good DSLR body, lens and flashgun, I only needed an accessory to allow magnification to complete my first Macro Rig. As mentioned in Getting Your First Macro Gear, the three most common macro accessories to get are (i) Reverse Ring, (ii) Extension Tubes or (iii) Macro Conversion Lens. I didn’t have a hard time choosing since I was pretty sure I would love Macro Photography (I have been taking macro shots using my first Point-and-Shoot long before I had a DSLR). I chose an autofocus-capable, sturdy but also the most expensive option- Kenko Extension Tubes. This proved to be a great pick since it is fast, rigid and convenient to use. What’s more, Nikon cameras will have aperture problems if you choose to use cheap, plastic Extension Tubes or Reverse Rings (To be covered later). With the Extension Tubes, I had some test runs with Natural Lighting and soon switched to flash. I had no idea that light diffusion was so important in Macro Photography then, so I just use my SB-700 with the bounce card up for lighting. The flash was held with my left hand and fired wireless. Sometimes I use my pinky finger to support the lens for reduced handshakes. – Lightweight, can be used one handed i.e. one hand holding the camera, the other the flash. – Simple setup, easy to gain access to hard-to-reach areas i.e. leaves, bushes etc. – At 3x ET, the very short focal lengths require the user to get very close to the subject; hence everything is larger and clearer through the optical viewfinder, thus easier to see which parts of the subjects are really in focus. – Since the flash is handheld, lighting manipulation can be done very easily. – Switching in between ET is very time consuming and risks dropping the lens or missing the moment. – The need to get really close for higher magnification is not feasible for sensitive insects. – The flash + bounce card diffusing technique still produces harsh lightings, especially when shooting subjects on walls or shooting subjects directly from the front. Mark II– Addition of a dedicated macro lens to the Mark I setup. I took quite a lot of macro shots using Mark I, and ignorant as I am, I still didn’t figure out the key to better images is to improve light diffusion, as covered in How To Take Better Macro Shots- Lighting. However, I realized that I really fancy Macro Photography, and will probably keep shooting while I can, and this was enough~ After all, the most important thing is passion. Regardless, I do notice the drawbacks of Mark I: I am annoyed with the extremely short working range of the 50mm plus all Extension Tubes (36mm + 20mm + 12mm). A working distance of ~3-5cm will scare most subjects away, thus losing the shot. Also, the time taken to switch in between tubes can be inconvenient and risky. Additionally, the approximate 1:1 magnification is hardly enough for my use. This was when I have decided to purchase a 100mm macro lens from Nikon, making up Mark II, which is basically a very basic setup. I shot using the same flash method. I have temporarily placed my Extension Tubes aside. During this time I have made some great macro friends, and learnt about some of the wise and famous within the field. Thanks to them, I have gotten the chance to learn about weaknesses in my skills and gears. – The 105mm F2.8 is an awesome lens, enabling shots from far (portraits) to near (macro), very versatile. – The 105mm lens allows magnification of up to 1:1 from a distance, thus very good for sensitive, or flying subjects. 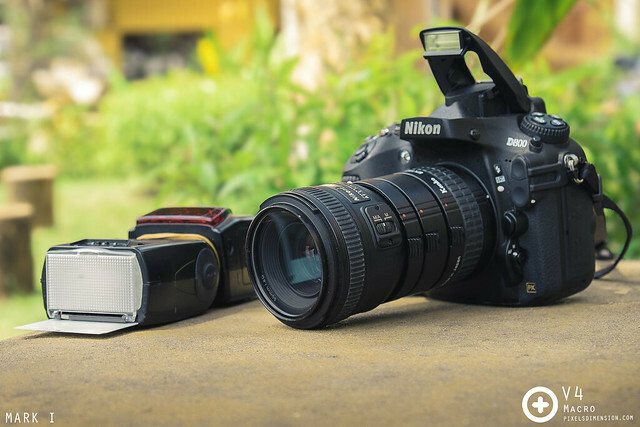 – The 105mm micro lens come with Autofocus and Vibration Reduction (VR). Although I don’t use VR, autofocus does come in handy for large subjects. – Since the flash is handheld, lighting manipulation can be done very easily (as long as the subjects are not too far away). – The long minimum focal length will make photographing small subjects challenging since it will be hard to determine which parts (usually the eyes) are in focus. – The farther effective working distance will mean higher prone to hand shakes. – The 105mm lens is not capable of going beyond 1:1. – The focusing system is not stellar when it comes to shooting small subjects, with the lens often undergoing AF hunting. Its even worse when shooting via LiveView. Mark III– A huge improvement in terms of magnification and light diffusion, courtesy of advices from the Macro gurus! It didn’t take me long to notice that the 100mm lens, although very fast, accurate and sharp, is not suitable for highly magnified shots. This is because at 1:1 (which is not enough for many cases), the Depth of Field (DOF) becomes too thin to produce good photos of tiny subjects (say <1cm) on top of the susceptibility to handshakes. So, the solution was simple, I “reappointed” my trustworthy Kenko Extension Tubes. By adding these tubes, the magnification of the entire system increased, meaning I could take 1:1 shots even before I turn the dials of the 100mm macro lens to “1:1” (The magnification ratio of the lens becomes inaccurate once you add on macro accessories). I started off with all three levels of Extension Tubes (36mm + 20mm + 12mm), and quickly noticed that the very high magnification means the chances of getting a blurred shot (caused by wind, subject or body movement) is high. Also, the Kenko tubes (three levels) had problems supporting the heavy 100mm lens. My 20mm Tube lost electronic connectivity and had to be sent back to the factory. From there, and as advised by my gurus, I shot using only the 36mm + 12mm Extension Tubes, and found that they are more than enough for most, if not all tiny subjects (<1cm). Again, thanks to my Macro sifus, I have finally decided to improve the light diffusion capability of my Macro Rig. I have purchased a FotoPro dual flash bracket to hold the SB-700 flashgun in position, and a softbox to diffuse the light. Needless to say, the results improved tremendously despite the increased weight; the resulting light is much softer, creating shadows that are less harsh. I was really happy with the results, and shot A LOT with my Mark III. 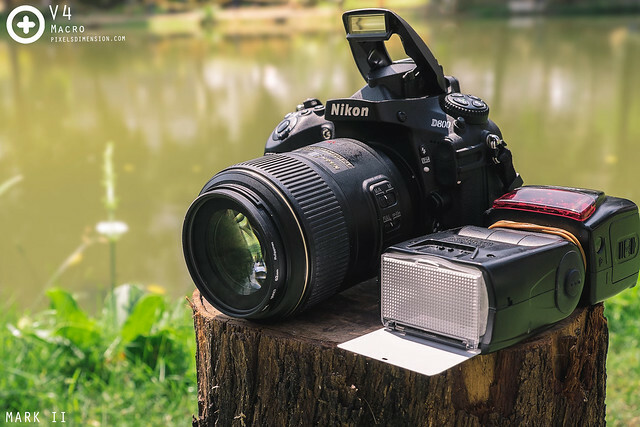 – This setup is still lighter than those with dual flashes. – The inclusion of extension tubes to the 105mm F2.8 lens allows magnifications over 1:1. Smaller subjects will appear larger through the viewfinder, thus easier to see what is in focus. – Even with ET, the 105mm is still able to zoom in and out to a decent degree, and hence still capable for use on a majority of sensitive insects. – The softbox diffuse light magnificently, resulting in well lit photos, regardless of the positioning of the subjects. – Heavy (duh!). One hand shooting is close to impossible. – The big softbox can sometimes be a hindrance when subjects are in a secluded location. 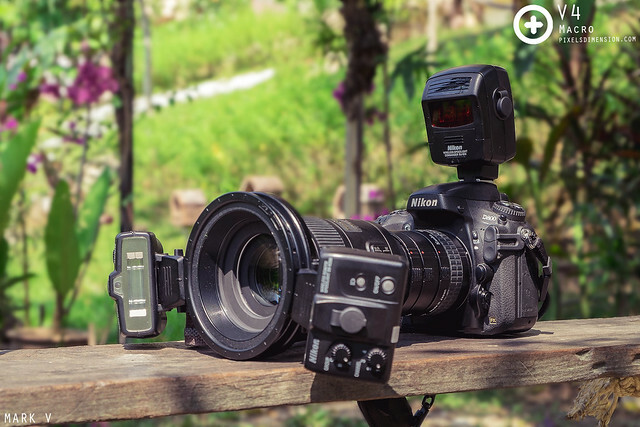 – Depth of Field (DOF) is very thin in this setup, which is normal for high magnifications. Of course, higher magnification = higher prone to hand shakes. – This setup is not suitable for flying subjects. – No support of the long lens plus ETs, which might strain the inner connections between the lens and DSLR body. 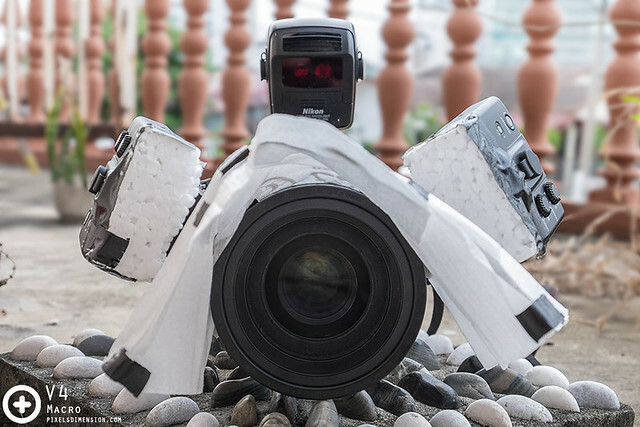 Mark IV– This setup improves light diffusion slightly with an inclusion of a 2nd wireless flash. After some really heavy shooting using my Mark III, I have really improved a lot in terms of shooting and editing skills (at least that’s what I think :p), but unfortunately, the heavy usage really took a toll on my Macro Rig: Apart from some serious wear-and-tear here and there, I have also single-handedly broken three Octopus joints of my FotoPro flash bracket, partly because the weight of the SB-700 flashgun. Anyway, I paid a lot of attention to cleaning and maintaining my optics and I am glad I have not gotten any fungus contamination on my lenses. The upgrade to Mark IV had one objective in mind- to produce better lighting. Since the flash on the Mark III is fired directly from the top, the light might sometimes be too harsh, especially on subjects with metallic carapace. The amount of shadows produced in Mark III could use some improvement as well. Since one side of my flash bracket is empty, I have decided to just get a small, but very popular flash in Macro Photography- Nikon SBR200 as a secondary flash. Since the SBR200 doesn’t come with a diffuser if you buy one individually, I had to DIY one myself, by using some polystyrene foam and paper. 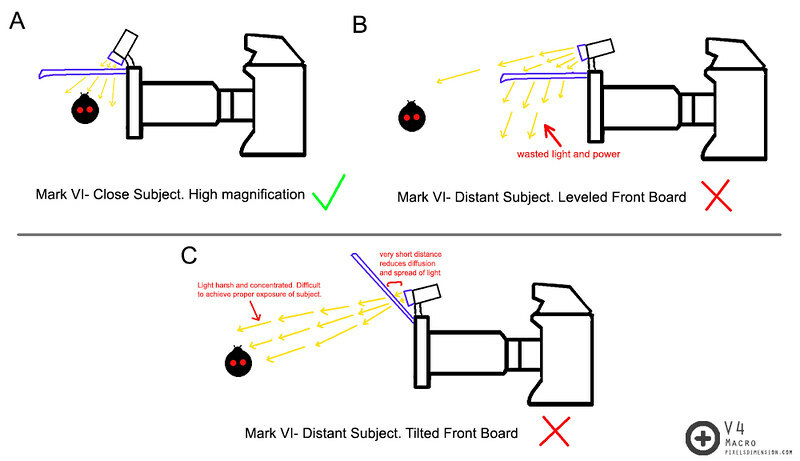 The initial idea of Mark IV was to have the flash fired from two ends- one from the left, and one from the right which will theoretically “cancel out” the shadows. Unfortunately, the heavy weight of the SB-700 means it is not possible (broke another octopus joint :/). I had to revert to my original Mark III positioning of the SB700, with the SBR200 fired from the right side. The lighting was definitely better than that of Mark III, but not on par with my expectations. What’s more, my Macro Rig has become ridiculously heavy, and the continual breaking of the FotoPro flash bracket is not my idea of fun. I had to come up with a better alternative, and I thought of getting a second SBR200 flashgun to replace my SB-700 to shave off A LOT of weight. On a side note, I have gotten a Macro Conversion Lens (the popular Raynox- 250) some time ago. It appears that this clip-on lens is not a very useful addition to a Macro Rig, unless if you are shooting something super, super small. Even that, you need some really serious skills and sturdiness to take such a shot. – Very heavy and bulky! As if the Mark III was not already. One hand shooting is close to impossible. The heavy weight of the SB700 kept on breaking the joints flash brackets. I don’t think I can use the SB700 any more in future setups. – The diffusers can sometimes be a hindrance when subjects are in a secluded location. Mark V– Finally a dedicated macro machine. Of course, having one doesn’t mean photos will automatically be better, have to try and improve diffusion techniques. I have very fortunately gotten a very great deal for a 2nd hand Nikon r1c1 macro set which has only been used twice! Needless to say, I have purchased it and took it out for a spin. Without the flash bracket and the SB-700 flashgun, my Macro Rig is now a hell lot lighter and less sophisticated, which is very good news to me. Of course, now that I know how important light diffusion is for Macro Photography, I have been trying to DIY some that will hopefully improve my shots. Will update more after I am familiar with the system. Of course, I have not given up on my Mark IV. Now that I have three Nikon SBR200 flashguns (how come there aren’t any rechargeable 3V batteries in the market?! ), I might try and see how they perform when attached to Mark IV. Okay, I have been able to play around with the r1c1 recently and have made some modifications to improve the light diffusion. 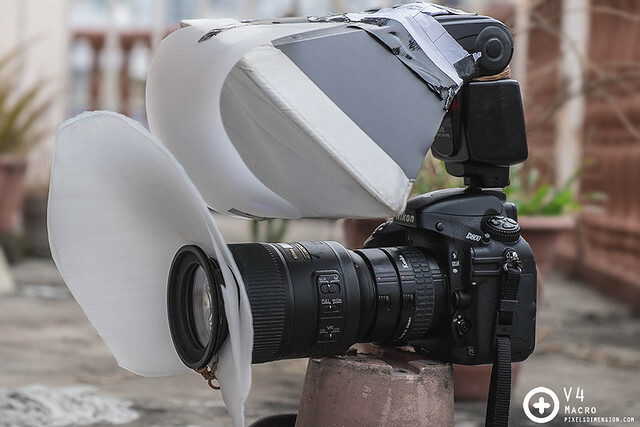 The setup is basically similar as the above; just some extra PE foams and polystyrene foams for the SBR200 flashguns and also the lens (coined Front Board from here onwards). The Front Board is made of PE foam (recommended thanks to melnikor macrography sifu) to help diffuse the light coming off the twin SBR200. 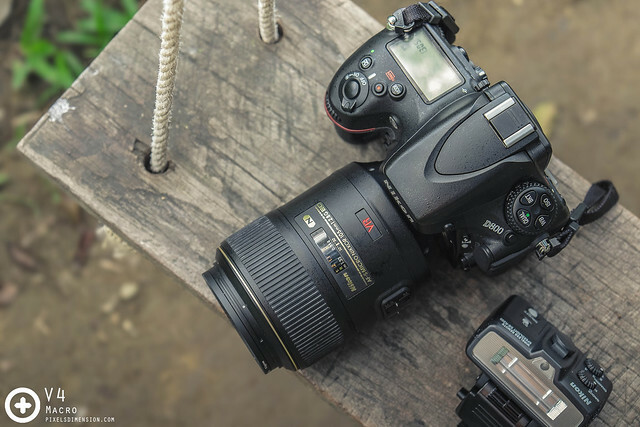 Mark VI– Is the Nikon r1c1 macro system THAT good? I, for one love to photography everything I see, be it big or small or distant or near, and I don’t want to spend minutes switching from one Macro Setup to another- I needed versatility, even if it means compromising weight. Thus, I immediately realized that this system may not be that suitable for my usual usage, unless if I want to take super up-close shots (but then the Raynox-250 Macro Conversion Lens doesn’t fit onto the r1c1!). Of course, I know that the light diffusion on the current Mark VI can still be further enhanced, but I simply cannot overlook this huge drawback. – Relatively expensive compared to a DIY system, and might not perform as good too. After I was done with Mark VI, I got into a little bit of a dilemma: I wasn’t sure whether I should continue to improve my previous Mark III (using flash brackets) or Mark VI (r1c1) systems; but I do know that I want a system that is versatile (suitable for photographing subjects that are large, small, near or far), even if it weighs a bit more than usual; the new system should be relatively cheap to maintain too. I figured that I don’t like to spend the rest of my life to keep on buying CR123 batteries for the SBR200 flashguns and also r1c1 flash trigger, so I have decided to use back my good old SB-700 flashgun which is running on 4 rechargeable AA batteries. It may be heavier, but at least the batteries can be recharged and reused, and the SB700 should have better flash firing rates. At the same time I have already ruled out using the flash brackets of Mark III to hold the SB700 in place. This is because the flash bracket kept on breaking under the heavy weight of the SB700 flashgun, as mentioned earlier. With this sorted, I finally realized what I wanted, and out came Mark VII. Mark VII- A prototype to test whether light diffusion works with the flashgun on the DSLR body. As you can see, each part of the system plays a certain role in channelling the light to the subject. There is much to love about my Mark VII macro rig. This is because it runs on a decently powerful SB700 with (happily) rechargeable AA batteries. Although slightly heavy, its not bulky. The relatively good channelling and diffusion of light produces pleasant, soft light. The curved diffusing board right in front of the box diffuser was placed there for a good reason- to channel the light downwards (the one channelled upwards are wasted unfortunately). The light channelled downwards will light up the lower parts of the O-ring diffusion board, which will theoretically give a half-O reflection in reflective surfaces. However, the poor usage and channelling resulted in insufficient light reaching the bottom of the O-ring board. 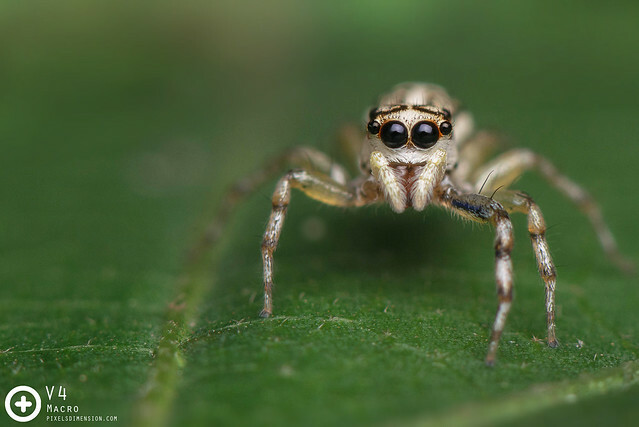 This affected the shape of the reflection, especially apparent in eyes of jumping spiders (salticidae) (see photo below for illustration). A cute Phintella versicolor jumping spider. Despite the wonderful light diffusion, the reflection of the lights from the eyes of the spider is less than satisfactory. This was because of too much light wastage in the Mark VII. I have to admit it sure takes up a lot of time to purposely set up each Macro Rig and photographing them, and then explaining about them. Still, I suppose sharing is caring; and I really hope you managed to learn new stuffs from this page. Okay, as of now you probably know that I am a very meticulous and particular guy about my Macro Rig. I need my Macro Setup to be versatile (able to shoot subjects big or small, near or far) and with effective lighting, even at the expense of weight. I like to design and plan out each diffusing parts before I build them, and I don’t really like to try-and-error like others do: I just don’t have the patience and time to do that. So here we have the Mark VIII, which is a more efficient version of the prototype Mark VII. 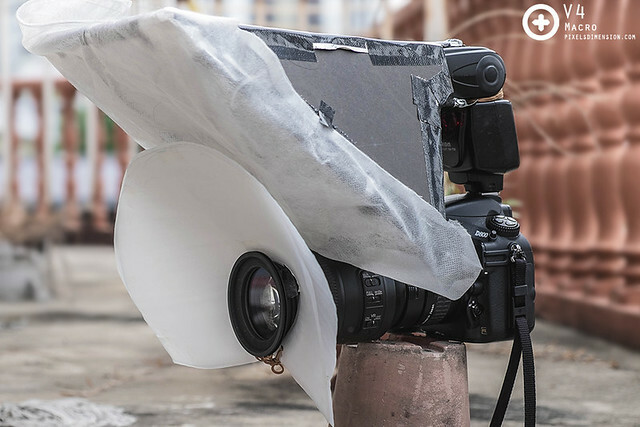 Mark VIII light diffusion- an upgraded version of the Mark VII’s, with more effective usage of light; making sure most of them end up on the subject. I have yet to be able to fully test the Mark VIII, but preliminary testing showed rather impressive results. I really look forward to use it soon. Of course, in theory there are still some limitations to this particular design. By right, using a much larger Front Board would’ve improve the light diffusion. But I am at this juncture still trying to find a suitable material for that. Alright! That’s all for today guys, thank you for reading, I hope you learnt something here hehe~ Until the next time! Cheers! ** Drawings are not drawn to scale and are for illustrations only.